Some of the mainstream media were reporting last week that there were no women figures in Character’s HMAF line up. Thats not the case at all. There’s a female figure on the way and at least one other in the design stage. The MoD are stressing that they want to see the range reflecting the diversity of serving service men and women in terms of both gender and ethnicity. 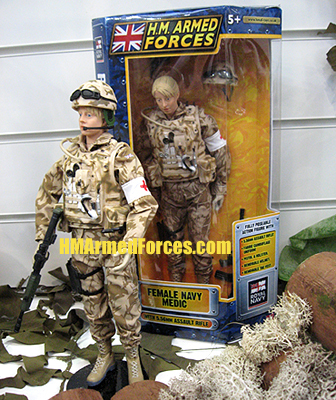 Therefore (drumroll) the first female action figure in the HM Armed Forces range will be … an Army Medic wearing desert camouflage. The Medic will be out in time for Xmas 2009. One footnote, the head sculpt for the medic is in fact based on an employee at Designworks, the Windsor UK based company that designs HM Armed Forces figures for Character Options. There are already plans for a second female figure. This could be (not confirmed) a frontline Army figure, but will feature the digital head sculpt of Olivia Smales of IMG, a licensing agency to the MoD. So whilst the Army Medic will be available over the counter by Xmas we may have to hold out till 2010 for Olivia’s frontline reinforcements.